a wonderful place to stay. 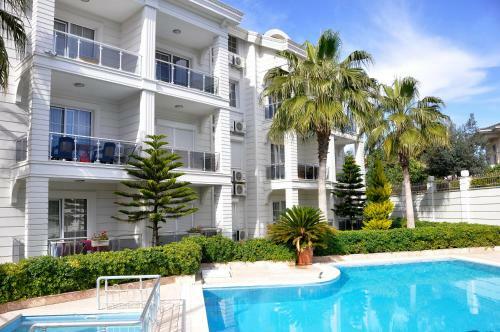 spacious, very elegant apartments, walking distance to all the attractions of kemer, and fast wifi. most importantly— the staff here are amazing. responsive right away if there is any issue, and will check in to make sure that everything is going well. there is no amount that i can say about how nice the staff are. always ready with recommendations and good will. the beach is one block away, and also another, private beach is located about 5 minutes from the residence. apartments are extremely clean and beautiful. comfortable beds, an open, very well functioning kitchen (gas stove, very good refrigerator) as well as two bathrooms and a washing machine (very convenient). the pool is large and pleasant. the apartment had many balconies with beautiful views. Last minute booking due to finding the property we were staying at unacceptable. They were very friendly and ready to assist in any way possible. The apartment was spacious and good views and walking distance from the beach. The place was clean, close to shops and restaurants. The staff (Tariq) was pleasant and very helpful. We really enjoyed our stay. We really enjoyed the nice mountain view from two balconies of the total four. The manager is a very polite person, his English is good. The guy agreed to keep our suitcases for several hours after the check out. The staff was really helpful especially the lobby guy. The cleaning was pretty well done too. Overall location of the place is good, close to beaches and not too far from a few good restaurants and grocery stores. Lock in a great price for Kemer Residence 2 – rated 8.9 by recent guests! One of our top picks in Kemer.Located in Kemer, Kemer Residence 2 offers accommodations with free WiFi and flat-screen TV, as well as a seasonal outdoor swimming pool and a garden. The accommodations are air-conditioned and comes with a spa bath. All units come with a terrace with mountain views, a kitchen with an oven and a fridge, and a private bathroom. Some units feature a balcony and/or a patio with pool views. Moonlight Park & Beach is an 18-minute walk from the apartment. Antalya Airport is 37 miles away. This is our guests' favorite part of Kemer, according to independent reviews. 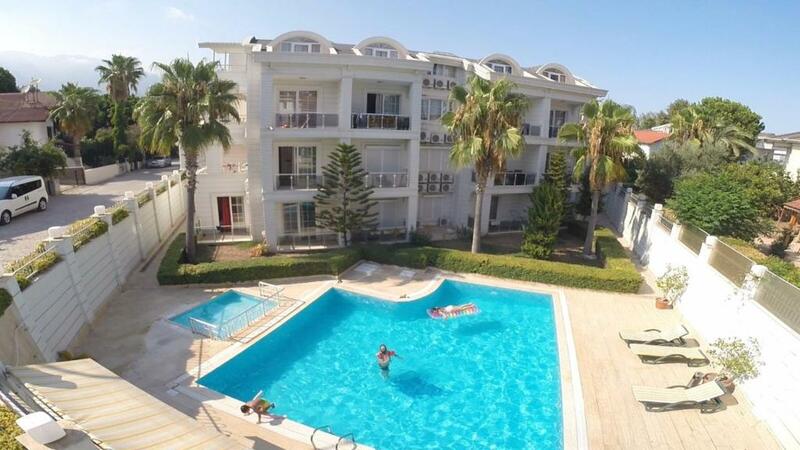 뀐 Located in the top-rated area in Kemer, this property has an excellent location score of 9.5! When would you like to stay at Kemer Residence 2? This apartment features a microwave, balcony and dishwasher. This apartment has a kitchenware, private entrance and air conditioning. Tesis 2016 yılında KCM Group işletme bünyesine geçmiştir. Toplam 12 daireden oluşmaktadır.Dairelerin iç kısımları çok rahat olup,geniş ailelere hitap etmektedir. Her daim ,kendimizi geliştirmek adına, müşteri memnuniyetini 1.sırada tutmaktayız. Turizm sektöründe uzun yıllardan beri Kemer bölgemizde hizmet vermekteyiz ve sizi tesislerimizde ağırlamaktan onur duyarız. Kemer bölgesi eşsiz bir doğaya sahiptir.Denize girerken arkanızda muhteşem Toros Dağların manzarasıyla kendinizden geçiyorsunuz.Yakınlarda Olympos dağına 2860m teleferikle ulaşıp,Akdeniz'i birde kuşbakışı seyretme imkanınız vardır. Ayrıca bölge çeşitli eğlence imkanları sunmakta,tatilini biraz daha sportif geçirmek ve dinlenmek isteyen tatilcilere yürüyüş parkuru , bisiklete binme vs.gibi çeşitli spor aktiviteleri için geniş yelpaze sunmaktadır. House Rules Kemer Residence 2 takes special requests – add in the next step! Kemer Residence 2 accepts these cards and reserves the right to temporarily hold an amount prior to arrival. Please inform Kemer Residence 2 of your expected arrival time in advance. You can use the Special Requests box when booking, or contact the property directly using the contact details in your confirmation. The bathrooms and the sleeping rooms are on the basement floor, the air smells like sewage. A lot of things need the repairs. There is no room service. The accommodation was not complete when it came to the bare necessities. Tariq needed to buy glasses for us and a sharp knife. there were only 2 cups and no kettle. again Tariq managed to get one sorted for us. However these are all things you would expect from a self catering apartment as a basic standard. Tariq sorted majority of this out so no harm done in the end. The next located five stars hotel had a noisy evening entertaining program. Everything was cool. Sea beach is near (200 meters). Shops (migros, carefour) - 10 minutes. Our apartment was clean and nice. P.S. Many thank to Tarik! The air con in the living area was poor but was getting fixed. Other than that, everything was excellent. Reception were brilliant, on the ball and always available should you needed anything. Spacious, and clean with all the necessary facilities. Property was clean had extras such as dishwasher and washing machine . Good location Staff very helpful and always willing to help and assist .